After an early morning snorkeling adventure, we departed from Praia do Forte for the island of Itaparica on Thursday morning. Two bus rides and a ferry trip later, we were being hosted at the houses of Patricia's extended family. Our students immediately noticed differences between the recently developed tourist location of Praia do Forte and Itaparica. While the four beautiful houses we are staying in have been in Patricia's family for the last century, there have been a spate of new very expensive houses being built in the area. This is in stark contrast to the majority of the island where many live below the poverty line with limited access and resources. After a brief orientation from Javier, we were on our way out to meet with students from the Quilombo Ilha organization. 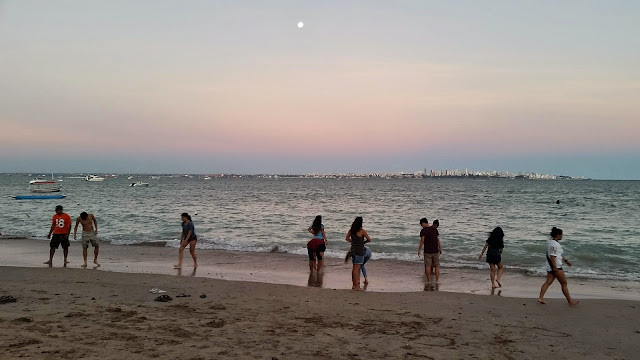 As we learned, Quilombo started less than ten years ago with the aim of helping young people on the island have a better success rate on their college entrance exams, and to then help them continue to feel supported once in college. Arriving at Quilombo, we were immediately welcomed by music and dancing. We felt very honored by the reception, and we tried our best to introduce NMH to our hosts. Our group gave an overview of NMH, and then explained what our motto of learning through the head, heart, and hand meant to them. Finally, while not as stirring as our hosts' music, we gave a spirited rendition of Jerusalem! On Friday, the group will continue to meet and work with students from Quilombo.